(Catasauqua, PA – July 29, 2017) YesterTec is excited to introduce the ultimate kitchen design experience! In lieu of installed cabinets the brand offers a vast array of freestanding kitchen workstations that can be used as an alternative to any kitchen design situation. Their newest UK66-LE Mini-kitchen model is notable for its beautiful moldings and distinctive sunburst design, but it’s what is enclosed behind the doors that is truly remarkable. Contained in a width of just five and a half feet is a compact, fully functional kitchen that includes up to five appliances, a sink, extra-deep countertops and an impressive amount of storage space. 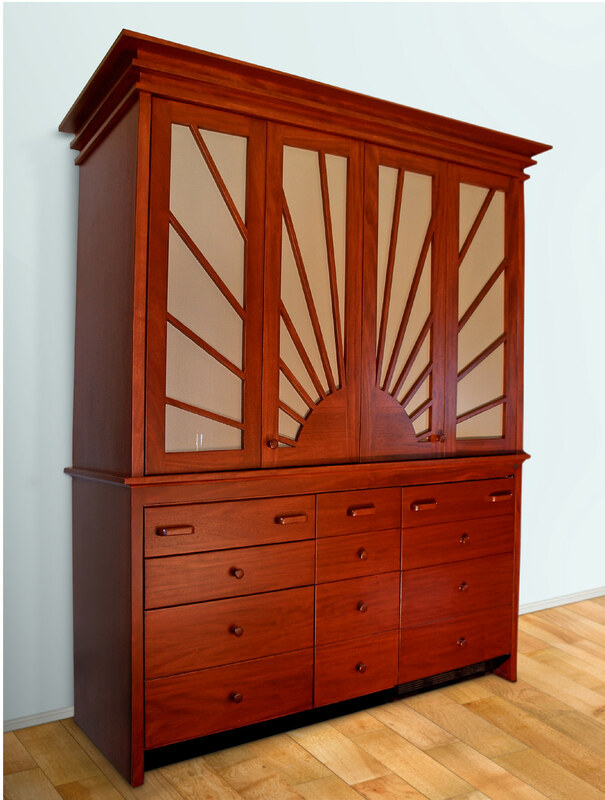 All of this is neatly housed in an exquisitely crafted armoire available in an array of lovely styles and finishes. 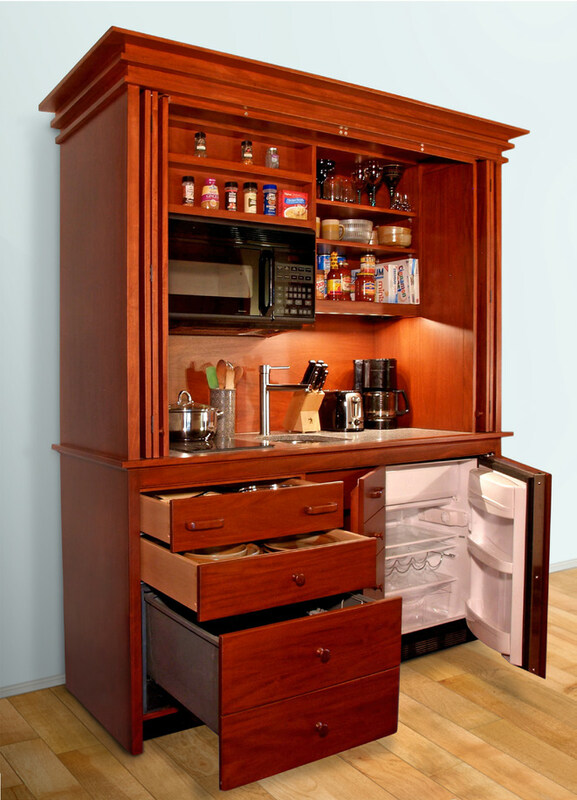 It’s an innovative way to add kitchen functionality to any small space while allowing the chaos of a typical kitchen to be easily hidden away when needed. YesterTec is the industry leader in creating Kitchen Workstation Furniture (KWF) as an alternative to creating kitchens with standard built-in cabinetry. YesterTec’s unique line of Mini-kitchens are perfect for multi-task rooms such as studio apartments, in-law suites, guest rooms, master suites, game rooms, pool cabanas or anywhere space is limited but a fully-equipped kitchen is desired. They are also ideal for boutique and extended stay hotel rooms, executive offices and break rooms. Units can be styled to complement any décor and may be installed as a freestanding piece or as a built-in. Think outside of the box and instead design with freestanding units. YesterTec combines intelligent design with beautiful woodworking craftsmanship. A fitting example, the UK66-LE model is a true workhorse of a kitchen. The interior features a 120V induction cooktop with its own set of pots and a sink large enough to wash them. The solid surface counter top is generously sized to hold small appliances and still leave plenty of room for prepping food. A spice rack and three adjustable shelves offer space for dry goods and dishes, while two drawers under the cooktop provide storage for pans and utensils. An optional third drawer can be replaced with a dishwasher if desired. Under the sink is an area large enough for a garbage disposal, a small trash can and cleaning supplies. Different models of ovens, microwaves and refrigerator/freezers are available to choose from, including upgrades with convection and speed cooking and refrigerator drawers with ice makers. YesterTec’s appliance hiding products have the distinction of being the only mini-kitchens in the world to offer technology that allows built-in cooking appliances to be safely concealed. Neither the cooktop nor the oven will function when the armoire doors are closed in front of them. Only when the doors are opened and slid into their pockets will the power to the appliances be activated. This thoughtful safety feature is UL Listed and allows for added peace of mind for both the homeowner and building inspector. YesterTec’s mini-kitchens are easy to order and install. Each piece is built by hand to exacting standards of excellence and quality. They are incredibly durable and are crafted to withstand years of daily use while enduring fleeting design trends. Because each unit is portable, every YesterTec mini-kitchen can be packed up and moved from one house to the next, or passed down to future generations. Imagine the possibilities of bringing your designs to life with a cleverly concealed kitchen within beautiful heirloom quality furniture. Visit yestertec.com for more information about the complete line of YesterTec kitchen solutions.